First and foremost, I consider myself a straightforward narrative sculptor. I work in steel, which is vandal and weather resistant and designed to be easily assembled on site. The steel is machined, hot-forged and welded. I am mindful of vandalism and public safety issues using columns to protect the artwork and as a method of announcement. I have worked many times with public art agencies, public space designers, landscape architects, transportation systems and private industry. I seek and enjoy input from historical reference, local idiosyncrasies, materials, inventions, etc., anything that gives me clues as a designer to make the concept belong to the site. I work easily with groups, am very organized and realize major projects within budget and on time with the aid of my team. I have created science partnerships with wind, structural and electrical engineers as well as lighting designers to realize kinetic sculptures and internally lit sculpture. I have worked with a gifted mechanical engineer to realize eight kinetic public art projects. It is most important to me that there be a multi-level concept understandable to the non-art- trained person as well as the esoteric critic. It is my strong belief that public art should not be simply museum art in a public space. This sculpture/gateway over the entrance road to Union Station celebrates the age of railroading and great industrial design. The locomotive of the Lehigh Valley Railroad moves forward and backward along the rails by electric motor and sprockets, chains and timers. 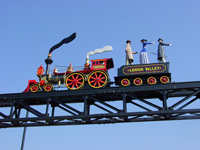 Three passengers dressed in the fashion of the era ride on the coal car and turn to face in the direction the train is moving. he smoke and the steam, mounted on bearings, move with the wind. 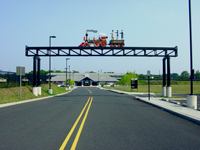 Union Station, Union, New Jersey, commissioned by NJ TRANSIT with assistance from the New Jersey State Council on the Arts, 2004, forged, fabricated painted steel, overall: L.58' x H.25' 5"" x W. 7', train: L.17' x H.6' x W. 2'. 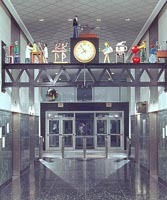 Some of New Jersey's many historical, mythological and present-day images are incorporated into this multi-level, kinetic sculptural installation in the heart of the renovated NJ TRANSIT station. The centerpiece is a 9 foot long NJ TRANSIT electric locomotive with a 3 foot tall engineer. Penn Station, New York, New York, commissioned by NJ TRANSIT with assistance from the New Jersey State Council on the Arts, to be completed in 2002; forged fabricated painted steel, overall H.12' x L.72' x W.20'. Two towers at the entrance to the zoo provide the sites for this colorful kinetic sculpture and clock combination. 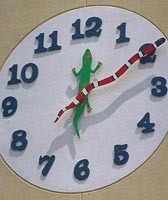 Every fifteen minutes, eight exotic animals accompanied by animal sounds, circle around, while moving in and out of the openings of one tower. Audubon Zoological Gardens, New Orleans, Louisiana, commissioned by the Audubon Institute, 2001; fabricated painted aluminum, overall size of carousel, H.11' x 17' square. Bridging the lobby of the Department of Labor Building is a sculptural homage to workers, not unlike classic WPA public art. A blacksmith raising his arm and striking his anvil, as the clock reaches the hour, adds whimsy in the spirit of the great European public clocks. 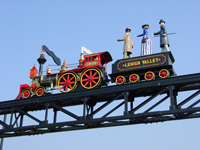 New Jersey Department of Labor, Trenton, New Jersey; commissioned by the NJ Department of Labor with assistance from the New Jersey State Council on the Arts, 2000; forged, fabricated painted steel, L.14'3" x H.6'6" x W.10". 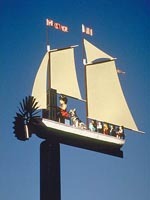 Schooner Heritage is a commemorative whirligig-type sculpture for Deb Lakin, a long time member of the Laumeier family. The schooner (from a favorite vacation) is the perfect structure, always keeping the propeller facing into the wind. Deb, with her arms moving up and down, is portrayed as a child playing her piano. Laumeier Sculpture Park and Museum, St. Louis, Missouri, 1999; forged, fabricated painted steel, L.6'8"x H.17' x W.2'. Three wind indicator sculptures in the shape of stylized airplanes celebrate three eras of Atlantic City history. Contemporary, mid-1900s and late-1800s. Atlantic City International Airport, Pomona, New Jersey; commissioned by South Jersery Transportation Authority with assistance from the New Jersey State Council of the Arts, 1999; wind indicators fabricated from aluminum, stainless steel columns, H.20' 4", each wind indicator: H.3' x W.4' x L.12'. Several "firsts" are celebrated in this colorful kinetic sculpture in the heart of Philadelphia. One ton of steel, balanced on bearings within the spindle and the column, moves gracefully to indicate a change in the direction of the wind. One Parkway, Philadelphia, Pennsylvania, commissioned by the City of Philadelphia's Percent for Art Program, 1998; forged, fabricated painted steel, H. 21' 9" x L. 18' x 8" at the beam, 2' at the base. The celebration of the history of aviation with whimsy and humor is the focus of this kinetic sculpture/clock tower. The designs of the flying machines draw from actual historical and present-day craft, flying toys, mythology, ideas that never were realized and pure fantasy. Charlotte/Douglas International Airport, Charlotte, North Carolina, commissioned by the airport and the Public Art Commission of Charlotte/Mecklenburg, 1997; fabricated painted aluminum planes and forged, fabricated, painted steel figure, H. 22' x Diameter 26'. This grand commemorative gateway celebrates the dynamic era when Corning was changing from a transportation center to a manufacturing center, circa 1868. All content © Copyright 2002-2008 George Greenamyer.